A hard-hitting report from the department for Business, Energy and Industrial Strategy (BEIS) Select Committee has backed the building engineering industry’s calls for tougher action on late payment. 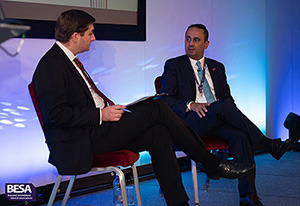 Alex Ozioro (left) with Paul Uppal. The committee, which carried out a wide-ranging inquiry into small business and productivity, has urged the government to introduce statutory requirements to pay within 30 days. It also said the Small Business Commissioner Paul Uppal should have an extended remit to cover construction and be given the power to fine late payers. The report also recommends that cash retentions be held in independent bank accounts and echoes last week’s announcement from the Cabinet Office that main contractors would be excluded from public sector contracts if they failed to pay their supply chains on time. “If government contractors are late with supplier payments, they could stop winning public contracts altogether – until they clean up their act,” said Cabinet Office Minister Oliver Dowden; adding that paying invoices promptly was vital to provide healthy cash flow “particularly for smaller businesses who are the backbone of the UK economy”. The Building Engineering Services Association (BESA) and the electro technical and engineering services body ECA, who have been campaigning on the issue of fair payment for SMEs and gave evidence to the BEIS inquiry, welcomed both developments. BESA’s policy manager Alexi Ozioro said there was “real momentum building up behind the wider campaign for SME contractors to get the fairer payment terms they deserve”. “This highly influential report from the BEIS Select Committee and the Cabinet Office’s intervention are highly significant especially with the anniversary of Carillion just a month away. This reflects growing political pressure to address behaviour that is not just morally wrong, but is also bad for the UK economy by putting perfectly good businesses at risk of insolvency. “Connecting fair payment to procurement is a powerful statement from government, and a very welcome development,” added Mr Ozioro. ECA deputy director of business and SME business adviser to the Cabinet Office, Rob Driscoll, added his support and explained that the Cabinet Office SME panel had worked tirelessly with civil servants to improve the landscape for SMEs doing business with the public sector. Both bodies are leading the campaign behind the ‘Aldous Bill’, which is due to have a second reading in the House of Commons in January and now enjoys the support of 270 MPs. This private member’s bill aims to ensure retentions are held in trust to protect sub-contractors from upstream insolvencies like Carillion and the BEIS Select Committee has now backed this approach. Over £10.5bn of SME working capital is locked in retentions annually, with cash flow issues leaving them unable to invest in skills, training and ways to improve productivity. Carillion held around £800m in retentions at the time of its insolvency. Government research shows that £700m of retentions was lost via upstream insolvency in the last three years and the industry loses almost £1m each working day (£20m a month) in vital cash flow because of the practice of withholding sub-contractors’ money. At the recent BESA National Conference, Mr Uppal said late payment in construction was “simply a bad way to do business”.